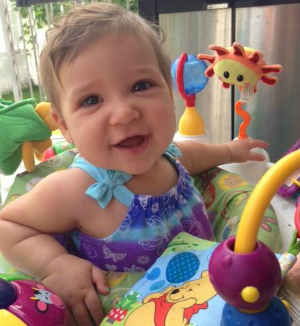 Looking at her now, you would never now 9-month-old Mikela spent the first month of her life in the Pediatric Intensive Care Unit (PICU) of the Montreal Children’s Hospital. But right after her birth, the newborn was rushed to the Children’s and diagnosed with pulmonary hypertension (abnormal high pressure in the vessels bringing blood through the lungs) and shock after experiencing difficulty breathing. The medical team in the PICU proposed a form of treatment for Mikela called Extra Corporeal Membrane Oxygenation (ECMO). During ECMO, blood is circulated outside the body (extra corporeally) and is filled with oxygen by an artificial lung (oxygenator) and circulates with the help of an external pump, allowing the tiny newborn’s lungs to rest. Mikela underwent the treatment for 3 days, and was then able to be taken off and put back on a regular ventilator. Then, after 4 weeks of hospitalization and steady progress, Mikela was deemed strong enough to be discharged home, a moment that Lisa will never forget.